It sure takes lots of musical guts to take on one of the most loved and influential rock songs of the last twenty years. But that doesn't deter Yuna from covering one of those classics she loves and make it her own. Check out her beautiful, heartfelt and accomplished acoustic cover of Nirvana's "Come As You Are" that premiered on Vevo today. The Malaysian singer has been performing the song during her live shows and encouraged by positive feedback from fans she decided to record it. Yuna may be new to most of us here in the States, but the singer is already a household name in her home country of Malaysia. In 2008, Yuna released her self-titled EP in Malaysia and the single "Deeper Conversation" became a massive success and went on to win the title of Best English Song at the 2009 AIM Awards, Malaysia's national music awards. Yuna swept the ceremony, also garnering Best Pop Song and Song of the Year for her Malay song, "Dan Severnarya". 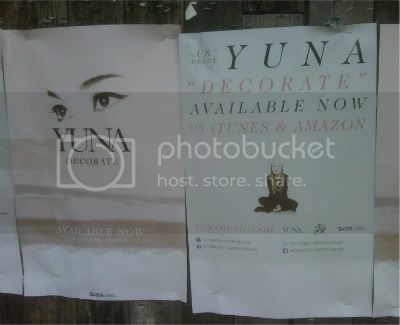 Listen to New Yuna EP "Decorate"
Yuna posters were all over South by Southwest this year. Time for something a little different. If you feel like you need some music to help you relax and recharge, or if you're just looking for some tunes for a lazy, rainy day, make sure to check out Yuna's brand-new digital EP "Decorate." Yuna's music has a serene and delicate quality that calms the soul and warms the ear. A gorgeous effort that comes straight from the heart. Yuna may be new to most of us here in the States, the singer is already a household name in her home country of Malaysia. In 2008, Yuna released her self-titled EP in Malaysia and the single "Deeper Conversation" became a massive success and went on to win the title of Best English Song at the 2009 AIM Awards, Malaysia's national music awards. Yuna swept the ceremony, also garnering Best Pop Song and Song of the Year for her Malay song, "Dan Severnarya". Inspired by artists ranging from Fiona Apple to No Doubt, Yuna picked up a guitar and began to fervently write at the age of 19 when she was in law school. She joined various art groups and recognized her love and natural talents for sketching, photography, web design and graphic design.